I’m on the other side of the world, at the almost northernmost point of the north island. This is Cape Reinga, where the Tasman Sea meets the Pacific Ocean in a spectacular swirl of currents. It is a sacred site, steeped in spirituality; for Māori, this is the place where the wairua (spirit) of their recently passed loved ones depart to the afterlife, their homeland Hawaiki. I am here with two friends but, for a while, I stand alone. Tourism is usually rife but, mid-winter, we are amongst the few. I look out at the wild water, mesmerised by the ebb and flow. To my east, there is a Pohutukawa tree on a rocky point, reputed to have been in position for about 800 years and is thought never to have blossomed. Mythology says that the spirit must climb down steps formed by the roots of this tree into the ocean. This panorama sings with stories. I have long been interested in the concept that landscape is not only what we see on a physical level but, moreover, an ideology that we interpret spiritually. We sculpt ourselves from our history, traditions and memories and these, in turn, are affected by our environment. New destinations can feel both familiar and unfamiliar. One can be greeted by a wave of emotional connection to a place where they have never been. Here, in Cape Reinga, I feel a deep connection to this land on which I have never stood. If water symbolises emotions, then I am the embodiment of the crashing seas in front of me. In this moment, I feel a collision of memories and sentiments. I am a child of the sea, born and brought up in a small fishing village, the daughter of a fisherman. There is salt in my blood. My memories are awash, fuelled by the commonality of water. The play I will write is called The Water Clan and, in this moment, I understand what I am trying to explore. I realise it is about belonging; about the land we stand on and the places we call home. About finding yourself when you didn’t even know you were trying. It is about connection to the elements and finding the divine within the everyday. It is about Scotland and New Zealand but, moreover, about the generations who have journeyed between these lands, over the seas, long before my birth. It is about the stories we tell and the reasons we tell them. But there is another feeling; an understanding beyond the play and the job which has brought me here. It is a moment of personal truth, of looking in the mirror for the first time and seeing a new reflection. It is a sense of being a part of a much bigger picture. It is a gasp of gratitude where I thank everyone and everything that has brought me here. I return to my friends. Life changing opportunities don’t come along very often. If I skip back to the start of the year, travelling to New Zealand was nothing but a childhood pipedream. Then I saw Playwrights’ Studio, Scotland and Magnetic North’s advert for the 2018 playwriting exchange; three months living and working on the other side of the world. I read the details feverishly. This was it. I applied with zealous anticipation. I wanted this opportunity more than I wanted anything in a long, long time. You see, New Zealand was more than just a place for me. It was THE place. To explain, I have to skip back even further through the years. 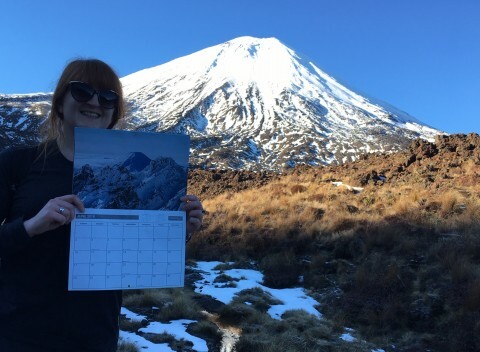 Every Christmas, throughout my childhood, I received a New Zealand landscape calendar which took pride of place in our kitchen. This was sent by my deceased father’s best friend, Jim; after sailing in the Merchant Navy together and travelling to New Zealand, Jim had emigrated there. As a young girl, I loved receiving the calendar and flicking through the monthly pictures. Those images were ingrained in my mind and I mythicized stories about Jim time and time again. One day, I told myself, one day I will go there and meet him. I’ll hear his stories about my dad and their travels. One day. The beautiful part of this story is that I did, indeed, meet Jim whilst I was in New Zealand. That’s another story for another day but it was everything I could have wished for and more. The calendar story also became central to the plot of my play and, because of this, I found myself completing a research road trip taking in all 13 places (the gift of an extra month) from the most recent calendar I’d received; including the aforementioned Cape Reinga. A childhood story became my adult, professional inspiration. My teenage self, at home in my wee fishing village, would never have believed it was possible. There’s so much I could share about my time away. There’s the beautiful people I worked with and the lifelong friends I have made. There’s the theatres I visited and the productions I saw. There’s the road trip that took me from the bottom of the southern island to the tip of the northern island via a glacier, thermal forest and nine-hour hike over a mountain. There’s the Māori language classes I attended and the brief education I had into the history of colonialization. There’s the mythology and stories woven throughout the landscape. There’s the food and drink that was shared alongside songs and poems. There’s the discovery of Dunedin with its folk clubs, Highland games and Rabbie Burns statue. There’s Wellington, where I called home, the coolest little capital in the world. There’s Rough Mix, with Magnetic North, where I played and explored creativity with local artists. There’s a writing retreat with fellow playwrights, staying in a little wooden cabin, and wondering what on earth I was going to write. There’s the eventual play-reading with seven actors performing my words, a blend of Scots, Māori and English language, in full Ceilidh style. There’s coffee and wine, there’s sun and snow, there’s mountains and sea. As I remember, I cannot help but smile; these memories will last a lifetime. They say that people make a place and this is an ultimate truth. Beyond the stunning scenery, at the heart of New Zealand is the Māori, European, Pacific Island and Asian melting-pot population. There is a Māori expression, taught to me by my friend Anya, that summarizes this perfectly: "He aha te mea nui o te ao – he tāngata, he tāngata, he tāngata" meaning "what is the most important thing in the world, it is people, it is people, it is people". I was hosted by BATS Theatre, Playmarket New Zealand and Toi Poneke Arts Centre and these organisations introduced me to some of the most beautiful folk I have ever met. Cross-cultural exchange offers a chance to step outside one’s own self. The results are greater than the sum of all parts as different backgrounds, traditions and perspectives unite. I can only see things from my own cultural upbringing – until I have the opportunity to share in someone else’s. Working internationally is a chance to understand the world better, to gain insight into others’ lives and to access multi-national viewpoints. The more we can understand about a place – not just facts and statistics, but beliefs and influences – the more effectively we can connect and communicate. As borders and national identities become trickier and more restrictive, it is more important than ever to consider the political through the personal. At Cape Reinga that day, I realised that I have much to learn about my own country and my place in the world. This was my moment of trying to comprehend Scotland and Scottishness, and my small part within a much bigger landscape; of all that has gone before and all that will come. In Māori culture, ‘whakapapa’ is the recitation of genealogy – I cannot claim to be an expert but I will try to share a hint of my learning. As ever, I am overtly aware of cultural appropriation and emphasise that everything I experienced is through my lens as a white, working-class, female Scot. Whatu ngarongaro te tangata, toitū te whenua. People will perish, but the land is permanent. My reflections at Cape Reinga could be summarised by this single sentiment. Everything that brought me to that moment is part of a story much bigger than I alone. Standing on the cliff, I thought about my own whakapapa; of my ancestors, of the Highland clearances, of the fishing industry. Sometimes we need to go away to understand where we’re from and, on the other side of the world, I was struck enormously by the notion of being rooted or grounded, physically, to a place. My play, The Water Clan, is a story about everything I felt that day in Cape Reinga and more. At the very heart of it, it’s about people trying to find their way through life and the narratives we create to help us survive. It’s a story about stories. If there is one single truth I will remember from Māori culture, it is this: our time is only temporary and nothing exists in isolation. We tell stories to remember, to memorialise, to fantasise; most of all, we tell them to live. I think the people of New Zealand are grounded because they understand the land that they walk on; the history, the battles, the culture, the ever-present politics of ownership. This is the challenge I take home – to try to understand my own land and ancestry. Life has been busy since returning to Scotland but I continue to mull over the big questions I stirred whilst away. I’m working on my third draft of The Water Clan and can only hope that I’ve managed to capture some of New Zealand’s magic within the writing. What I do know, unequivocally, is that I’m the luckiest person alive for being given this opportunity. I cannot thank all of the partners enough for making this happen: Playwrights’ Studio, Scotland, Playmarket New Zealand, Magnetic North, BATS Theatre, Toi Poneke Arts Centre, Creative Scotland and Creative New Zealand. Thank you. Morna is a playwright, actress and musician from a wee fishing village in the North East of Scotland. She is recipient of the 2017 Dr Gavin Wallace Fellowship (hosted by Creative Learning, Aberdeen City Council), the 2018 'Tomorrow at Noon' award for female playwrights (Jermyn Street Theatre, 2018) and the New Playwrights Award 2014 (Playwrights' Studio, Scotland). She is also the 2018 recipient of the Scotland-New Zealand playwriting exchange (BATS Theatre, Toi Poneke Arts Centre and Playmarket NZ). LOST AT SEA, her first full-length play, was developed in 2013 with award winning Stellar Quines Theatre Company and is now in pre-production with Perth Theatre for 2019. Other plays include: AYE, ELVIS ('a Play, a Pie and a Pint' and Gilded Balloon as part of Edinburgh Fringe 2018), THE BUKE OF THE HOWLAT (Findhorn Bay Arts), SMITE (Jermyn Street Theatre), NETTING '(a Play, a Pie and a Pint' and Scotland wide tour with Woodend Barn, Banchory), SHE OF THE SEA (Paines Plough 'Come to Where I'm From' at The Lemon Tree), B-ROADS (Play Pieces), NEVER LAND (Eden Court) and two short theatre plays for the National Theatre of Scotland's GREAT YES, NO, DON'T KNOW SHOW. Current commissions include THE WATER CLAN (BATS Theatre, New Zealand) and she is developing further work for theatre with Magnetic North, Stellar Quines and The Tron. She has also performed extracts of her work at the Scottish Parliament, The European Author's Festival (Czech Republic, Slovakia, Poland) and as part of National Poetry Month, France. Morna primarily writes in Doric and is a proud Scots Language Ambassador (Education Scotland). 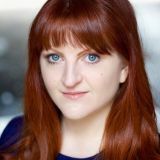 As an actor, Morna has worked for companies including the National Theatre of Scotland, Royal Lyceum, The Beacon, a Play, a Pie and a Pint (Oran Mor/Traverse), Alterean Media, ITV and BBC Worldwide. Morna is also an Associate Artist of Out of the Darkness Theatre Company and tidy carnage. A multi-instrumentalist, she plays fiddle, flute, percussion and clarsach. Album recordings include Kevin McKidd's SPEYSIDE SESSIONS (No.1 in the itunes world music charts) and THE FISHWIVES (TV appearances include The One Show and BBC Breakfast). She has composed scores for several theatre productions including SUNSET SONG (The Beacon). She is one half of the band FOLKIFY (alongside Sandy Nelson) who were in residence at The Tron in 2016. She was equally flattered / mortified to be voted the 11th most eligible woman in Scotland 2014 by the Scotsman on Sunday (but, as her Auntie quite rightly pointed out, "nae quite top ten...'). Morna is currently based between Glasgow and Moray.